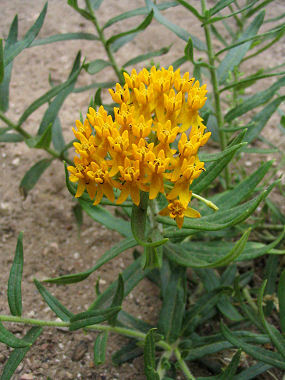 Butterfly Weed is a member of the Milkweed Family. The plant grows to 3 feet in height and has light green, narrow leaves that grow to 4.5 inches in length. The plant typically grows in dry open grasslands and in clearings in pine forests at elevations between 4000 - 8000 feet. Unlike most milkweed species, the sap of the Butterfly Weed is not milky. Butterfly Weed blooms between May - September and produces a bright cluster of orange or yellow flowers with 5 petals to 0.5 inches in width each.